Gene therapy is a mostly experimental technique that uses genes to treat or prevent disease. It was first developed in 1972 but so far has had limited success. When perfected, this technique may allow doctors to treat a disorder by inserting a gene into a patient’s cells to counteract a malfunctioning gene instead of using drugs or surgery. Gene therapy is designed to introduce genetic material into cells to compensate for abnormal genes or to make a beneficial protein. If a mutated gene causes a necessary protein to be faulty or missing, gene therapy may be able to introduce a normal copy of the gene to restore the function of the protein. A gene that is inserted directly into a cell usually does not function. Instead, a carrier called a vector is genetically engineered to deliver the gene. Certain viruses are often used as vectors because they can deliver the new gene by infecting the cell. The viruses are modified so they can’t cause disease when used in people. Plasmid DNA: Circular DNA molecules can be genetically engineered to carry therapeutic genes into human cells. Viral vectors: Viruses have a natural ability to deliver genetic material into cells, and therefore some gene therapy products are derived from viruses. Once viruses have been modified to remove their ability to cause infectious disease, these modified viruses can be used as vectors (vehicles) to carry therapeutic genes into human cells. Bacterial vectors: Bacteria can be modified to prevent them from causing infectious disease and then used as vectors (vehicles) to carry therapeutic genes into human tissues. Human gene editing technology: The goals of gene editing are to replace harmful genes or to repair mutated genes. 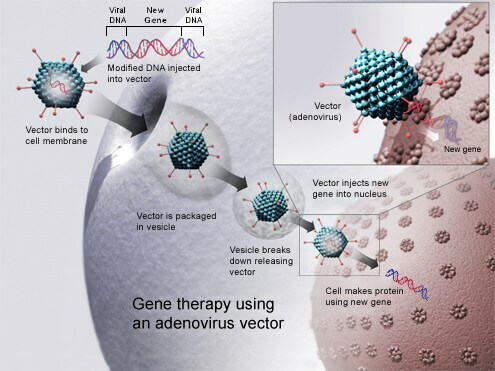 Patient-derived cellular gene therapy products: Cells are removed from the patient, genetically modified (often using a viral vector) and then returned to the patient. What disorders have been or might be soon treated with gene therapy? Hundreds of clinical trials are underway studying the technology’s potential use in a wide range of genetic disorders, cancer and HIV/AIDS. There is some debate over whether or not the US already has approved its first gene therapy treatment. In August 2017, the Food and Drug Administration (FDA) approved a cancer therapy—a CAR-T treatment marketed as Kymriah—that uses a patient’s own T cells and is a variation of the gene therapy that is being developed to treat single-gene diseases. The T cells are extracted and genetically altered so that they have a new gene that codes for a protein, known as a chimeric antigen receptor (CAR), that is a hybrid of two immune system proteins. One part guides the cells to the cancer cell targets and the other alerts the immune system. The cells, programmed to target and kill leukemia cells, are then injected back into the patient. Another CAR-T treatment, marketed as Yescarta, was approved for adults with aggressive forms of non-Hodgkin’s lymphoma in October 2017. Some in the scientific community have pushed back against the idea of calling Kymriah or Yescarta true gene therapies, since they don’t actually repair or replace a deficient gene. Instead, they say the most likely candidate to gain the first US approval is Luxturna, a one-time treatment that targets a rare, inherited form of blindness. A key committee of independent experts voted unanimously in October 2017 to recommend approval by the FDA for the treatment developed by Spark Therapeutics. The FDA is not bound by the panel’s decision, though the agency traditionally acts on its recommendations. A 7-year-old boy whose outer skin layer was nearly gone due to a genetic disease had it replaced, using his own genetically-modified stem cells, according to researchers from Germany, Austria and Italy reporting in Nature in November, 2017. He is now 9 and the doctored stem cells appear to be doing their jobs. The gene therapy, done in an emergency operation to save his life, could conceivably be used to treat other people with junctional epidermolysis bullosa (JEB). Doctors successfully treated 15 babies who had spinal muscular atrophy type 1 (SMA1), a disease that gradually paralyzes babies and typically results in death by the age of 2. The treatment, reported in the New England Journal of Medicine, used a virus to carry the therapeutic gene through the bloodstream to the brain. That it was able to cross the so-called brain-blood barrier was a notable achievement, suggesting that scientists may be able to access the central nervous system easier than previously thought. Why are gene therapy treatments so expensive? The companies argue that their treatments, while expensive, can be considered a bargain when compared against the lifetime medical costs related to the diseases that are being treated. To that end, MIT Technology Review looked at the medical costs for several diseases being targeted. The lifetime costs for a 45-year-old with sickle cell disease was nearly $1 million; annual treatments for men with hemophilia cost $150,000; and the treatment for severe combined immune deficiency could top $4 million. Still, there are no guarantees the market will bear the costs of these treatments. The first gene therapy to be approved in Europe was Glybera, designed to treat lipoprotein lipase deficiency (a form of pancreatitis). The drug ended up being scrapped after insurers and health agencies refused to pay the $1 million price tag. Inventor UniQure abandoned plans to seek US approval for the treatment. What are the ethical and religious challenges of gene therapy? Who decides which traits are normal and which constitute a disability or disorder? Will the high costs of gene therapy make it available only to the wealthy? Could the widespread use of gene therapy make society less accepting of people who are different or have issues treatable by gene therapy but are unable to afford it? Should people be allowed to use gene therapy to enhance basic human traits such as height, intelligence or athletic ability? The World Anti-Doping Agency (WADA) has banned gene therapy since 2003 (and has extended its ban to gene editing) “if [these techniques] have the potential to increase performance.” This is called somatic gene therapy, which transfers DNA to cells that do not produce sperm or eggs (somatic cells). There is a clear distinction between somatic cells, those making up almost all of the body, and germline cells, which are the eggs and sperm and the cells that produce them. Somatic gene therapy cannot be passed to a person’s children. The more controversial use of gene therapy is what is called germline editing—the transfer of a section of DNA to cells that produce eggs or sperm and could be passed to future generations. While germline gene therapy could spare future generations in a family from having a particular genetic disorder, it could conceivably impact the development of a fetus in unexpected ways or have long-term side effects that are not yet known, although the extent of those potential differences is fiercely debated. Those who would be affected by germline gene therapy are not yet born, so they can’t choose whether to have the treatment. Because of these ethical concerns, the government does not allow federal funds to be used for research on germline gene therapy in people. How is gene therapy regulated? Because of the regulatory and scientific challenges surrounding gene therapy, the technology may become prohibitively expensive for patients other than those participating in clinical trials, which typically do not charge patients. And because the techniques are relatively new, some of the risks may be unpredictable. The FDA regulates all gene therapy products in the United States and oversees research in this area. Those who wish to test an approach in a clinical trial must first obtain permission from the FDA, which has the authority to reject or suspend clinical trials that are suspected of being unsafe for participants. In November 2017, the FDA announced that it will speed up its review process for promising gene therapy treatments. The National Institutes of Health (NIH) provides guidelines for investigators and institutions (such as universities and hospitals) to follow when conducting gene therapy clinical trials. These guidelines state that clinical trials at institutions receiving NIH funding for this type of research must be reviewed by the NIH Recombinant DNA Advisory Committee (RAC) to determine whether the work raises medical, ethical or safety issues that warrant further discussion at one of the RAC’s public meetings. Multiple levels of additional evaluation and oversight ensure that safety concerns are a top priority in the planning and carrying out of gene therapy research. Olympic medicine: Are elite athletes really healthier than the rest of us?